Combined P&P for additional items purchased from us! Check out our matching items! 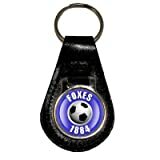 Foxes since 1884 black leather keyring with circular design. Length (excluding ring) approx. 65mm. Width (excluding ring) approx. 41mm.